After bureaucratic formalities, check-in and making a security deposit in the charter base, leave the marina with the afternoon maestral, which may often gust well over 20 knots in the Pašman channel. Sail towards the passage and bridge of Ždrelac (3 Nm) between Ugljan and Pašman. Before departing from the charter base, make sure to ask about the maximum height of the mast, which must not exceed the height of the bridge during high tide (16.5 m). IMPORTANT: The passage under the bridge is wide enough for one sailboat and right of way is given to vessels approaching from south-west. If you’re not sure about the height of your mast, there is no need to push your luck and end your vacation before it has started. Instead, turn north-west and sail around Ugljan (17 Nm). You can make your first overnight stay off the island of Iž, in a magnificent channel behind the Islet of Knežak, only 5 Nm away from Ždrelac (or 17 Nm if you have taken the longer route around Ugljan). There you can anchor at the depth of 4 m and have a swim in crystal water. Those with diving experience can also search the sandy bottom for delicious vongole clams, which abound here. There are a few buoys in the channel under the concession of the owner of an excellent Knež restaurant (tel. 00 385 23 27 81 11) in the nearby village with the same name, where you will be served fresh fish from the Adriatic on prior reservation. There are a few moorings with water and electricity connections (against additional payment of 10 €) that are free of charge for the guests of the restaurant. You can do the morning shopping in the village and buy fresh fish from local fishermen who often stop on the water front. After breakfast set sail to the south-east cape of Iž and then turn to Dugi otok. If you feel like having a swim, you can anchor at the islet of Rava. The Paladnica (7 Nm) and Ovča bays on Dugi otok (9 Nm) are especially beautiful. In the afternoon continue towards the northernmost cape of Dugi otok. Be careful of the rocks between Zverinac and the north cape of Dugi otok. The safest option is to proceed closer to Zverinac. Continue towards the deep bay of Pantera (14 Nm). At the extreme north tip of the Veliki Rat cape you can see the remnants of a ship that ran aground in 1984. Secure the sailboat to one of the floating buoys in the bay and use the auxiliary boat to get to the shore. There you can have a closer look at the tallest lighthouse in the Adriatic (42 m). On a clear night its light can be seen from as far away as 22 Nm. If you have been overtaken by night, you can stop at the DM restaurant (tel. 00 385 98 50 11 76) located in the Čuna bay further to the south. There are 2 or 3 mooring buoys in front of the restaurant at the maximum water depth of 2.5 m. The two specialties you cannot afford to miss are their sea urchin cake and fantastic lobster noodles. Sail with the morning burin to the village of Molat (5 Nm) on the island of Molat, secure the boat at the town’s waterfront or at the quay a bit further to the north with water and electricity connections, and treat yourself to a morning coffee in one of village bars. If you need to stretch your legs, there is a big basketball court in the Jazi harbour just a few minutes’ walk from the village. However, if you’re more in the mood to enjoy an early afternoon swim, sail around the south cape of Molat to the channel between Tun Mali and Tun Veliki. There you can drop anchor in turquoise water at the depth of some 7 m off the woody islet of Tovarnjak (5 Nm). Then continue north-west to Silba (8 Nm) or the slightly bigger Olib (10 Nm). Both islands are interesting, as they mark the boundary between Kvarner and north Dalmatia. Silba is a more touristy and lively option offering a long series of taverns, bars, shops, recreational grounds and a disco. If you decide to anchor out, we recommend the bay of Sv. Ante to the south-west, which is also equipped with mooring buoys during summer months. You can reach the town following a nice 2 km footpath. Silba’s east port is usually packed and inaccessible in bora; just outside the port, there are only a few buoys, which are often filled up during the summer season. When the sky is clear, don’t miss the stunning sunset from the west pier on Silba. In the case of a strong bora, you may prefer to go to the more peaceful Olib, where you can anchor in the bay of Južna Slatina (just be careful of the shallows on the south-west side!) or Sv. Nikola, where it is recommended to anchor with the stern line to the shore. If you prefer a safer option, you can moor at the village pier equipped with electricity and water connections. North of the pier you will also find some 10 buoys. The true gems of Olib are its old buildings and local inhabitants who massively migrated to the United States during the 1950s and 1960s. Today, they are slowly returning with their children and one can often hear them converse in impeccable English, including the port administrator. The decision whether to visit Silba or Olib is yours. The morning burin will take you south-east to Sestrunj (16 Nm), where the best places to have a short swim are on the south-east side of the island. You can anchor in the shallows between the islets Paranak Mali, Paranak Veli and Sestrunj. Then the afternoon maestral will take you south by the islands of Iž and Rava, to the fishing village of Sali (14 Nm), the sailing centre of the aquatorium and an excellent starting point for exploring the Kornati National Park the following day. If you have spent the last few days mostly motor-sailing in still weather, you can fill the reservoir in a bay just before the village of Zaglav. 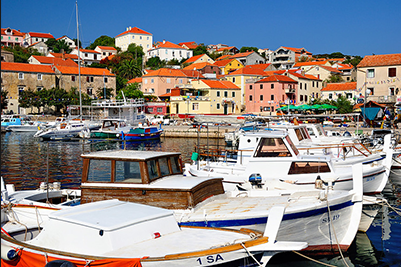 Sali, as the administrative and tourism centre of Dugi otok, offers plenty of affordable mooring places with electricity and water connections, as well as bathrooms. It is also one of the few marinas with full authorisation to collect port fees, as the total annual revenue of the marina belongs to the local community and is invested in infrastructure development. During the prevalence of south winds, it is safer to secure the boat at the west pier, which is also recommendable for those in the need of a good night’s sleep. The more restless members of the crew, however, can get their share of party in the famous disco bar Maritimo located right next to the east pier, where music doesn’t stop until dawn. Sali has a rich, millennium tradition of fishing and agriculture. It is especially known for its olive oil, which you can simply buy at street stalls. The most famous cultural event that takes place every other weekend in August is the annual city games, “Saljske užance”, with a donkey race as its main attraction. An event truly worth seeing! Sali also has port administration, numerous restaurants, an internet cafe and grocery stores. In the off-season, it is a very popular safe haven for big fishing ships, which come here to wait for better weather conditions. Fresh fish can be bought almost every day on the waterfront. If you feel like dining out, we recommend the Kod sipe restaurant located higher in the village, the Marin restaurant serving delicious tuna steaks, and Pizzeria Toni. 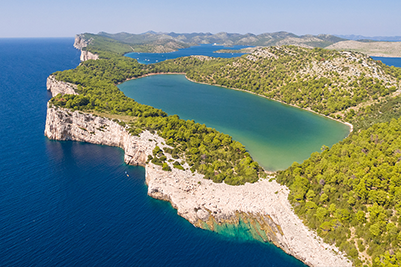 The tourism cooperative offers cheaper entrance tickets for the Kornati National Park or the Telaščica Park, which you are going to visit the next day. From Sali set sail to the Mala Proversa channel (8 Nm) separating Dugi otok from the Kornati National Park. Once you are in the channel, you have entered the Telaščica National Park. So, if you decide to secure the boat to a buoy or an anchor, be prepared to pay 10 € / person. Visit the Mir cove, a saltwater lake and the attractive 100 m high precipitous cliffs in the Telaščica National Park lying north of Proversa or continue further south, towards the famous Kornati islands, where you will be charged some 35 € for a boat of up to 10 m.
The Kornati archipelago comprises 140 islands scattered across no more than 30.000 hectares of sea area, thus representing the most condensed archipelago in the entire Mediterranean region. In 1980 it was declared a national park and placed under protection. 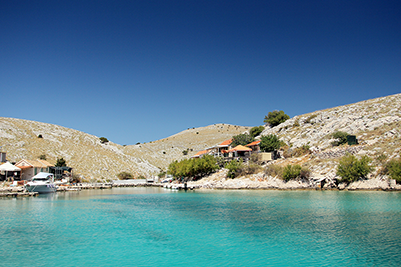 Entrance tickets for the Kornati National Park are also available at tourist offices in every major Dalmatian town at approx. 30 % lower price. A hint: If you want to moor in the Kornati National Park, we recommend you to do so in front of one of many regular concession taverns where you will only be charged for your food and drink. Prices are quite steep here, up to 30% higher than in the Kvarner area. Fish in the Kornati archipelago will cost you somewhere between 50 and 70 € / kg. We recommend taverns like Mare in Katina (tel. 00 385 98 27 38 73) and Darko in Strižnja (tel. 00 385 98 43 59 88), where you will find a safe mooring for the night or anchorage in the cove facing the islet. Sail around the outer side of the Kornat island (that is, if you have spent the night somewhere in the middle of the Kornati National Park), between the islets of Lavsa and Kameni Žakan, and turn north at the island of Smokvica (7 Nm), which is also the last island in the Kornati archipelago. Then continue towards Žut (10 Nm), where you can stop to have a dip in the channel of Žutska Aba. Or continue further along the west coast of the island (to avoid shallows and rocks on the east side) to the bay of Pinzelić (11 Nm) or Bizikovica (12 Nm), where you can anchor and dive into crystal water. In the early afternoon set sail towards Pašman in the east, where you can make a stop in the breathtaking bay of Landin (8 Nm). There you can anchor or tie the boat to one of 20 or so floating buoys under the control of the family-run tavern Landin. The tavern itself is located in the neighbouring bay and its owner will welcome you with home cooking and a free mooring in front of his tavern. Another specialty of the Landin tavern is countless witty anecdotes of the owner, who long served as ocean-going captain. His wife, on the other hand, makes a delicious octopus dish in a wonderful atmosphere just a few meters away from the sea. The morning’s catch of fish usually ends up on the evening’s menu as well. During the prevalence of strong south winds avoid mooring in the port and anchor in the bay of Soline or Sv. Ante further north, where you can start the next day swimming under the fragrant pine tree grove. This is the last day of your sailing trip, so take time for relaxation. Given that your return route to Marina Kornati in Biograd is only several Nm, explore islands S of Pašman such as beautifull Vrgada (6 Nm), where you can have a dip and an early afternoon lunch. You can sail around Murter archipelago or visit litoral towns such as Drage or Pakoštane. In the afthernoon, you need to fill the reservoir at the gas station at the entrance to the marina, return the boat to the charter operator, recover the security deposit and return home filled with impressions.